Vertical siding meets metal roof accents to bring modern style to this angled Ranch design. The angled orientation of the master suite creates a private retreat that is surrounded by windows. Couples will enjoy the dual sink vanity, separate walk-in shower and freestanding bathtub, and a spacious walk-in closet. 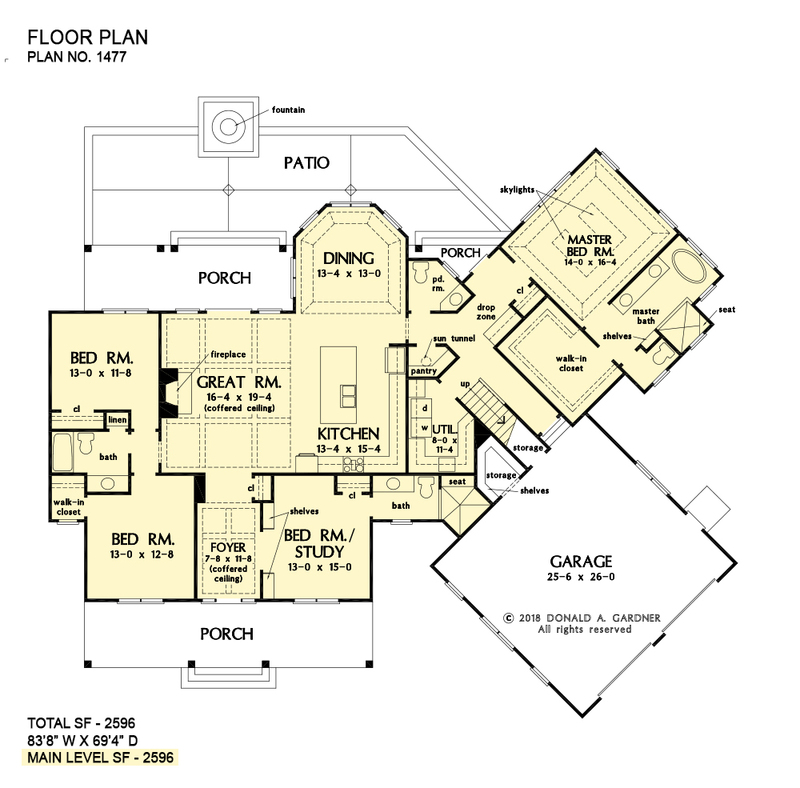 The floor plan is open with an easy flow between the great room, kitchen, and dining room. A drop-zone and pantry offer storage and organization for busy lives. Three additional bedrooms round out this family-friendly design while front and rear porches invite outdoor relaxation. 1st Floor: 2596 Sq. Ft. 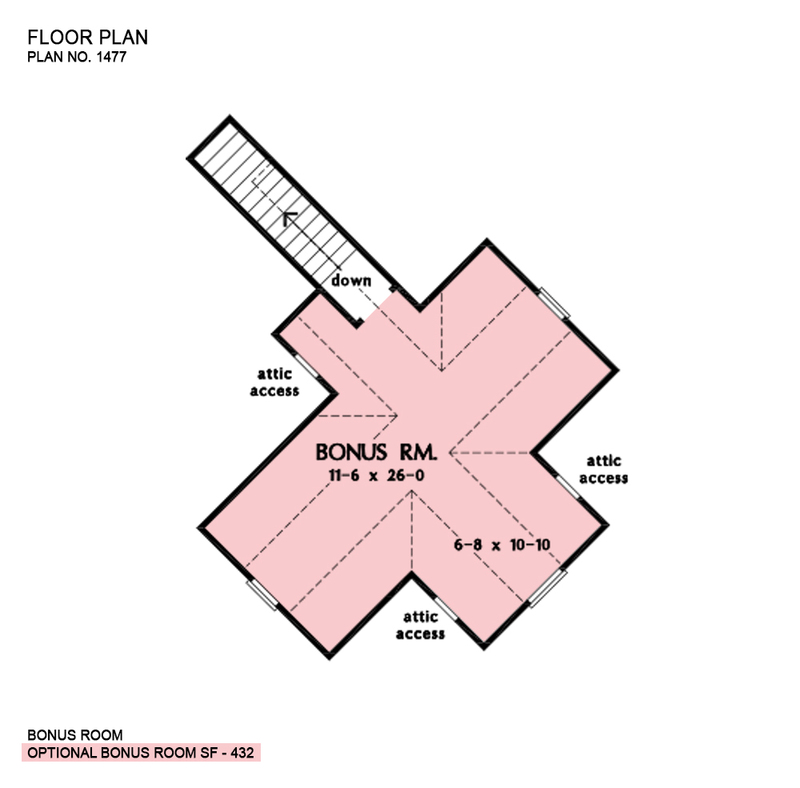 Bonus Room: 432 Sq. Ft.
Porch - Front: 288 Sq. Ft.
Porch - Rear Left: 203 Sq. Ft.
Porch - Rear Right: 24 Sq. 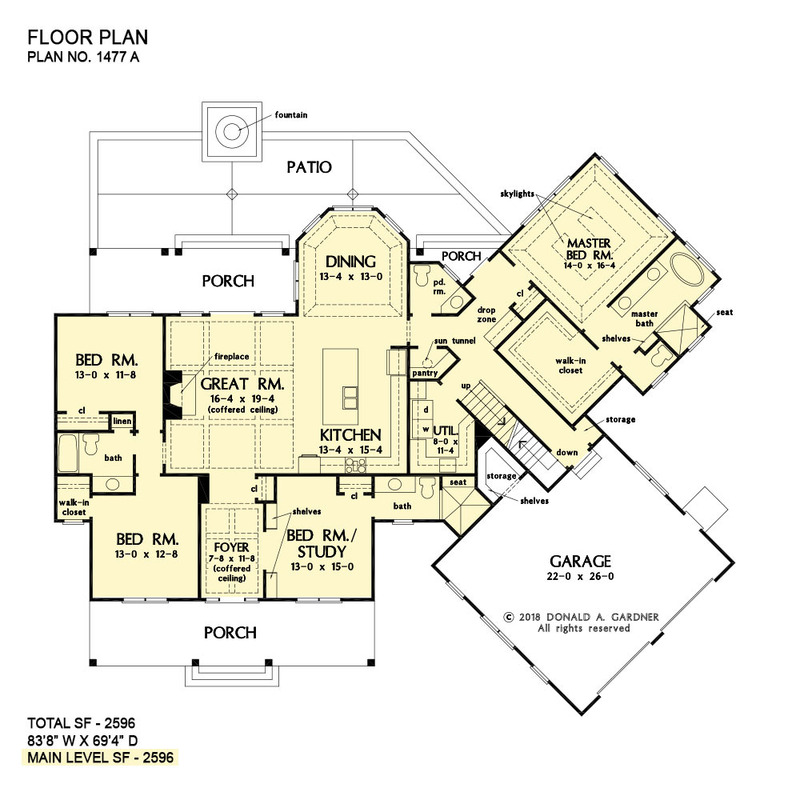 Ft.
House Dimensions: 83' 8" x 69' 4"
Great Room: 16' 4" x 19' 4"
Master Bedroom: 14' 0" x 16' 4"
Foyer (Coffered): 7' 8" x 11' 8" x 11' 0"
Dining Room (Tray): 13' 4" x 13' 0" x 10' 7"
Great Room (Coffered): 16' 4" x 19' 4" x 11' 0"
Kitchen (Flat): 13' 4" x 15' 4" x 9' 0"
Utility Room (Flat): 8' 0" x 11' 4" x 9' 0"
Bonus Room (Clipped): 11' 6" x 26' 0" x 8' 0"
Garage (Flat): 25' 6" x 26' 0" x 0' 0"
Garage Storage (Flat): 6' 0" x 5' 8" x 0' 0"
Master Bedroom (Tray): 14' 0" x 16' 4" x 10' 7"
Bedroom / Study (Flat): 13' 0" x 15' 0" x 9' 0"
Bedroom #3 (Flat): 13' 0" x 12' 8" x 9' 0"
Bedroom #4 (Flat): 13' 0" x 11' 8" x 9' 0"
Porch - Front (Flat): 36' 0" x 8' 0" x 9' 0"
Porch - Rear Right (Flat): 11' 0" x 4' 6" x 9' 0"
Porch - Rear Left (Flat): 25' 4" x 8' 0" x 9' 0"
Deck / Patio (None): 39' 4" x 14' 4" x 0' 0"
Drop Zone (Flat): 5' 0" x 2' 4" x 9' 0"
Storage (Other) (Clipped): 3' 4" x 6' 0" x 0' 0"